TRUMP IS LOOKING LIKE HE'S IN TROUBLE! HE WON'T BE CAUGHT! HE'LL TELL A MINOR TRUTH AND WHEN EVERYONE IS STUNNED HE'S GONNA HOP ON A PLANE AND LIVE WITH PUTIN IN THE KREMLIN! 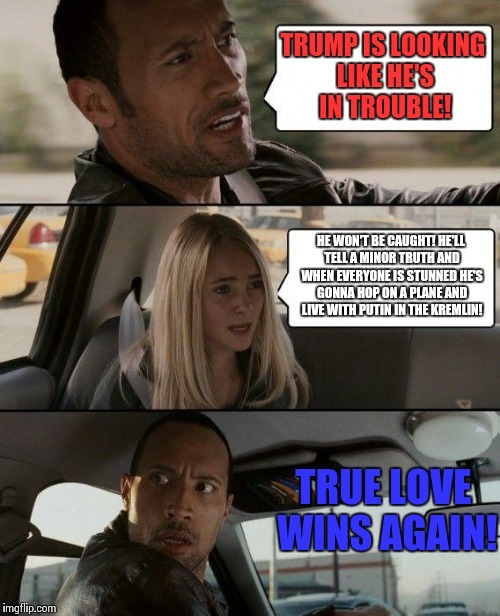 TRUE LOVE WINS AGAIN!